A memorial sampler for that special person or event or romance you want to remember forever. A wedding gift - a soldier - the birth of a child - or birthday. 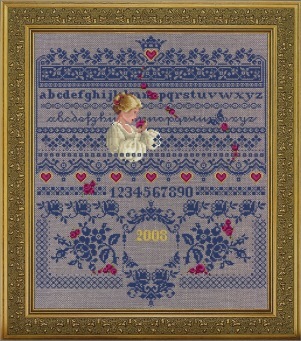 It is a dark blue sampler pattern with a woman holding a rose. The hearts can be made into purple hearts. This sampler records your special time, as the roses fall. Stitched 2 over 2 on 28 count linen Cobblestone (#3281/781/55) from Zweigart. 14 1/4" x 16 3/4"
Frame number 645G from Larson-Juhl. Copyright © 2008 Marilyn Leavitt-Imblum. All rights reserved.